Wal-Mart Supercenter Store Manager – Rhonda Williams, second from right, presenting a check to (L to R) Burton Center’s John Green; J. W. Goude; Laurie Cordell; Cleve Wiggley; Latoya Wideman and Buddy Traynham. 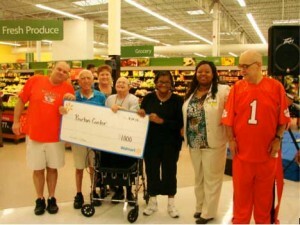 “We are grateful for this donation from Wal-Mart and appreciate all that they do for our community. These funds will be used to provide for the special needs of the people we serve,” stated Laurie Cordell, Deputy Director. Burton Center for Disabilities and Special Needs is a non-profit, multi-county agency, providing services for over 1,000 people with disabilities and special needs (autism, intellectual disabilities, head injuries, spinal cord injuries and related disabilities) in Abbeville, Edgefield, Greenwood, Lexington, McCormick and Saluda counties. Burton Center is a United Way agency.